It’s very easy to be a grouch and a designer will always home in what can be changed for the better. So I’m imposing a small discipline on myself that I will only criticise something that does not work when I have found something to praise first. That way only half my design commentary posts will be negative. This is the first of those. It’s about a company kidding itself that it is offering a helpful service. The other evening I was waiting for a train at a small local railway station, Dore and Totley on the outskirts of Sheffield. It was around 8:30 pm and, being November, it was dark. Dore and Totley is an unmanned station with an automatic ticket machine, operated by Northern Rail, who run local train services across the north of England. I had a problem with the ticket machine which had taken my payment but not issued a ticket so I was wondering what to do next. It looked like I might have an irritating time dealing with compensation claims, but also when the train came I would be boarding without a ticket. Although the train crew were unlikely to give me a problem there was a niggle in my mind over whether they would charge me the full single fare or the cheap day return that I had tried to buy. While pondering this I noticed that there was a little stainless steel obelisk on the platform which seemed to be some kind of help phone. A loudspeaker on the front and a couple of buttons to press. I thought that at least I could report the problem so it might be fixed more quickly for others, and I might get some useful advice or help about my ticket. That’s not completely transparent is it? I felt that “Press for Information” might be something passive, train times or whatever, “Press to call” implied that you would talk to a person and clearly I needed help so I pressed the assistance button. The first thing to happen was the sound of a phone dialling, which was quite reassuring, maybe I was being connected to somebody? The next response was less comforting, a recorded message telling me to press different buttons depending on which indecipherable service I wanted. As there was no keypad I could do nothing so I waited. After a while it decided to move on, I can’t remember if it offered me another list of options but eventually, after standing there being puzzled for quite a while, I heard a real person. I could almost make out what he was saying. So I explained the situation and said I realised they might not be able to fix it for me but at least they could take steps to avoid others being relieved of their money for no ticket. The guy was very friendly and understanding but said there was nothing he could do and it dawned on me that he wasn’t the railway company but a police officer. So I apologised for taking his time and he said if I pressed the other button I would get the right people. So I pressed the “Information” button and the machine dialled another number and there was a vaguely reassuring voice message implying I was being connected to something and then nothing. A little while later the train came and the conductor was very helpful. He knew there was a problem with that ticket machine and he didn’t expect me to buy another ticket so that saved me the irritation and fuss of asking for compensation. This was only what I would expect as I’ve always found Northern Rail train crews to be very helpful and supportive, using their discretion to stop problems turning into crises. But it left me pondering that help phone and the people who designed the system and operate it. You can imagine the artist’s impressions when they were planning all this, maybe there was a storyboard with a worried older person late at night being reassured by the help available at the press of a button. The stylish obelisk was modern and looked efficient, the station was well-lit and no doubt benefited from all kinds of health and safety and accessibility checks. Who could do more? As ever, the devil is in the detail. It all starts with the graphic design and use of language. Somebody decided that “Assistance” and “Information” were the right terms to use but it’s clear they confused me. The use of different expressions “press to call” and “press for” added to the confusion by implying different classes of service. I’m a well-educated person, language is my friend, but I fell at the first fence. One problem is that designers try to be too clever and look for simplifications or (heaven help us) buzzwords. It’s also possible that a generic design was used when it should have been labelled precisely for the actual service offered and in language that made it clear what to expect. 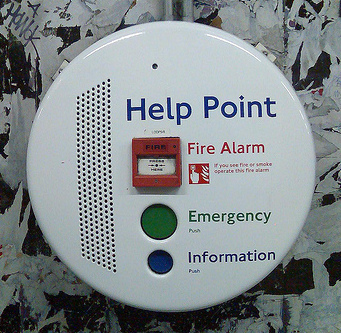 This Help Point, at Kings Cross Station in London, is a lot better in its clarity. I don’t think I would have been confused if this one had been at Dore, but it’s still not explicit, why not say who you will be speaking to? At a glance it’s easy to say what might be done. One button connected you to the police so why not label it “Speak to the Police”. The other one might be “Speak to the Train Company” or something similar. However the really important issue is that whatever you do should be tested with a cross-section of people in realistic circumstances. Easy enough to take some mockups to the station and ask people to try them while they are waiting for a train. People with ten minutes in hand and nothing to do are usually hard to find but on a railway station they are quite common. The Blue Phone shown here from University of Newcastle in Australia seems pretty good, it had three buttons labelled “Security”, “Switchboard” and “Emergency”, although I suspect that most people would be a bit confused by the choice between Security and Emergency, after all who would you call in an emergency if it is not Security? “Emergency Services” might be closer to the mark but if that’s the case why not just put “000” which is the phone number for the Emergency services in Australia? When I looked at the photograph from Dore station I noticed that the “Assistance” label has a little picture of a car with a flashing light on top. That might have alerted me but in fact I never noticed it. Always test things in the actual lighting conditions (the photo was taken with flash so it’s not representative). Having icons as well as text is no bad thing but they need to be very clear – luckily there is a national symbol for train services which could be used for the button currently labelled “Information”. At the moment it has the standard “i” logo which adds to the confusion as it is used for all kinds of passive information displays as well as tourist information. The red emergency phone shown here, from University of California Santa Cruz, is a nice example of very clear information. You are left in no doubt what the phone is for although a confused person might not immediately realise that you have to open the red box to use the phone. But that police car icon got me thinking. One of the reasons for these help phones on remote stations is that somebody might feel in danger. They might fall ill or feel threatened by somebody else, they might even suffer an attack or robbery by another person. They really don’t need a 2 minute wait in voicemail jail in those situations and as the device seems to be a phone there’s no reason not to add a “999” button (999 is the UK emergency services number) which would get a very quick response from an operator trained to deal with emergencies. The voicemail jail was just ludicrous and show that the system has never been tested. How is a person to respond when asked to enter numbers on a non-existent keypad, especially if they are already worried or confused or maybe have English as a second language? Clearly Northern Rail just used a public phone number without any consideration for the consequences rather than setting up a specific number for these calls, going straight to an operator. Finally there’s that dead line on the “Information” button. That might be a just a passing technical problem but I wasn’t convinced. Northern Rail operate 462 stations across the North of England. As these are local and rural services a good many will be unmanned. It doesn’t seem out of order to have one person on duty to deal with these calls (they can have other less critical work to keep them busy if there are few calls) and to have ways of checking whether the service is functioning at every station. These days a lot of that can be done automatically although having somebody go to a station and press that button from time to time is no bad thing. The really sad thing here is that, if you were to ask Northern Rail what they were doing about people’s security on unmanned stations, I’m sure they would cite this service as being good practice and they would believe that because it looks like they have not given themselves a way of knowing that they are falling down on the job. This is a classic service design problem and a simple one too. The need is well understood and companies generally recognise this as an area where they have to do well. Northern Rail have just failed to do the work as carefully and intelligently as they should, with proper efforts to understand the context and serious user testing, especially when the result has such a bearing on public safety and customer’s perceptions. Almost certainly at least one professional designer was involved in this, although maybe not in designing and setting up the way these are installed in stations. So who might we blame? Probably its a whole succession of less than professional and less than knowledgeable people. Too many designers fail to think through the consequences of their actions, too many businesses fail to understand how designing should work or take these small design problems seriously. But in the end it’s a failure of craftsmanship – people taking proper care and responsibility for the quality of their work. This entry was posted on 19 December 2013 at 3:05 pm and is filed under Service Design. You can follow any responses to this entry through the RSS 2.0 feed. You can leave a response, or trackback from your own site.